Duffield Evangelical Baptist Church is located on its own in a triangle of land off Town street where it turns off to Makeney Road. 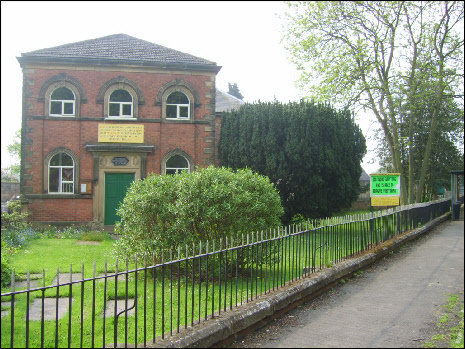 This chapel was built in 1830 although Baptists have been worshipping in Duffield since 1810. The building is listed under the 1962 Town and County Planning Act as of special architectural interest. In 1932 the A6 main road was widened, and about seven feet taken off the width of the burial ground. It was not until 1958 that the scattered gravestones were all repositioned, mainly along the church wall; and the whole area levelled. The name of the church was amended in 1970 and is now known as the Evangelical Baptist Church. JOSEPH BOWER died July 14th 1945. Margaret MILLS Mar 19 1870 17 days.